Photoacoustics is expanding at, well, the speed of light these days. 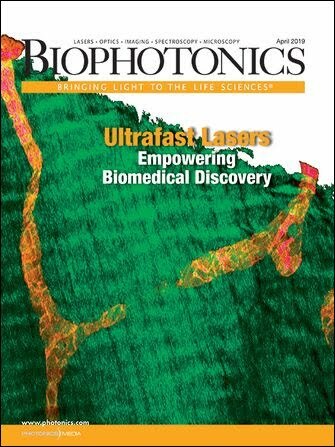 Sound-and-light-based imaging is one of the most quickly growing bioimaging modalities, according to journal publisher Elsevier, which last year debuted a new open-access peer-reviewed journal – called, appropriately enough, Photoacoustics – just to cover research in the field through original papers and review articles. The microfluidic device attached to an optical microscope. An ultrasound transducer is attached at the top, and a laser is focused into the device by the optical objective from below. Cells are streamed through the target area, where they are irradiated with the laser, and the resulting photoacoustic signals recorded by the ultrasound transducer. Courtesy of Michael Kolios, Ryerson University. The phenomenon was observed in the 19th century, he added, and technology has been “in progress” for several decades, with important spectroscopy developments since the 1930s and imaging advances since at least the 1970s. “In the 1990s, there were more than 250 papers published on the topic, and this number is steadily growing since then, reaching more than 1000 publications per year in recent years,” he noted. “In parallel, there is now commercialization of optoacoustic/photoacoustic systems and several system placements around the world. The top images show a top and side view of a 3-D-reconstructed phantom object made of gels and other materials that mimic human tissue. The background of this phantom mimics normal breast tissue, while several objects embedded within the material mimic blood vessels and tumors. The bottom images show two slices of images of a reconstructed phantom taken with the new device. The locations of five objects are indicated with arrows: objects 1 and 2 mimic blood vessels, while objects 3 to 5 mimic tumors. Courtesy of Wenfeng Xia, Biomedical Photonic Imaging group, University of Twente. The journal’s goal is to report on progress in the field and to develop the photoacoustics research community. And what a rich community it is: Researchers the world over are refining techniques and exploring new applications. Ntziachristos – who received the 2013 Leibniz Prize, the top science award in Germany, and the prestigious ERC Advanced Investigation Award – is one of those researchers. His current focus is multispectral optoacoustic tomography (MSOT), implemented at six dimensions to enable unprecedented 3-D imaging of tissues, particles and molecules over time with scalable resolution. Cross-sectional MSOT images from a tumor-bearing mouse. Using spectral information, MSOT can simultaneously image multiple molecules and agents by unmixing their spectral signatures. (a) Photograph of a tumor-bearing mouse. (b) Cross-sectional anatomical image (gray scale) along the dotted line in (a). Color indicates a molecular image showing the distribution of an avb3-integrin targeting fluorescence agent (IntegriSense, PerkinElmer) superimposed on the anatomical image. (c) The same cross-sectional image as in (b), unmixing the contributions of oxygenated and deoxygenated hemoglobin, showing hypoxia in the tumor core. Courtesy of E. Herzog et al (2012). Radiology, Vol. 263, Issue 2, pp. 461-468. The Institute for Biological and Medical Imaging he directs recently partnered with Carl Zeiss AG, with support from BMBF (the Federal Ministry for Educa-tion and Research), to develop the microscope of the future, which will be able to visualize much deeper than what is allowed by today’s microscopes. In parallel, a multitude of studies are applied to clinical settings to improve clinical diagnosis. This is a schematic illustration of the imaging system and the ultrasound detector. Courtesy of Wenfeng Xia, Biomedical Photonic Imaging group, University of Twente. Another prominent player in the field is Dr. Lihong Wang, professor of biomedical engineering at Washington University in St. Louis. He and colleagues published the first paper on functional photoacoustic tomography in 2003. Lihong Wang’s research is dedicated to the development of novel imaging technologies. The photoacoustic microscopy image shows a melanoma tumor. Such an imaging capability is expected to play an important role in both preclinical and clinical applications. Photo courtesy of Dr. Lihong Wang. Wang, who also is affiliated with the Siteman Cancer Center at Barnes-Jewish Hospital and Washington University School of Medicine, received a 2013 Transformative Research Award from the National Institutes of Health (NIH). Under the five-year, $3.5 million project, his lab will translate single-cell label-free photoacoustic microscopy (PAM) into the clinic for cancer screening, detection, prognosis and monitoring, using the label-free method to image circulating single-tumor and red blood cells. The method could someday help doctors make cancer diagnoses earlier and precisely monitor cancer treatments – at the single-cell level – and could speed up clinical translation of basic research. But that’s not the only high-profile project for which Wang received funding last year: The NSF awarded him a three-year, $300,000 grant to use PAM to study individual cells’ oxygen-consumption rates. Today’s technology allows biologists to study only groups of cells, not individual cells, for oxygen consumption. The technology could bring about broader understanding of various biological systems from single cells to ecosystems, Wang added; eventual applications could include stress response and toxicity studies. “The major future steps will be to translate this exciting technology into the clinic for human imaging,” Wang noted. “In addition to imaging of the breast, axilla and skin, other organs that can potentially be imaged include the upper GI tract, colon, brain, oral cavity, prostate, ovary and cervix. Our NIH Director’s Transformative Research Award will target in vivo imaging of circulating tumor cells. Wang’s collaborator on the NSF grant is Dr. Jun Zou, associate professor of electrical and computer engineering at Texas A&M University. But as with every researcher, Zou has a lot more on his plate, too. In a separate project, he and one of his Ph.D. students, Chih-Hsien Huang, received the Seno Medical Best Paper Award at SPIE Photonics West 2013 for “Water-immersible MEMS scanning mirror designed for wide-field fast-scanning photoacoustic microscopy,” a joint work between Zou’s Micro/Nano Imaging and Sensing Technologies (MIST) group and Wang’s Optical Imaging Lab. MEMS (microelectromechanical systems) scanning mirrors have extensive uses in optical imaging, projection and communications. But existing MEMS scanning mirrors fail when immersed in liquid; Zou’s group had overcome this limitation via new designs and fabrication processes. The new water-immersible MEMS scanning mirror achieves fast and simultaneous scanning of optical beams and also high-frequency ultrasound waves in a liquid environment. Also, existing PAM systems can take minutes to capture an image, thanks to the slow speed of conventional scanning components; the mirror reduces PAM’s imaging time to seconds or even fractions of a second, which opens up the possibility of studying dynamic pathological conditions and physiological processes that were previously not observable. The two teams will continue to collaborate on further developments in MEMS-enabled PAM for both clinical diagnostic and biomedical research applications. The real key is deoxyhemoglobin. Lipids, water, oxyhemoglobin and deoxyhemoglobin in the blood all respond to laser light. “By observing increases and decreases in these four things, we can tell if the tissue is malignant or benign,” Dogra said. The current standard method of diagnosis, transrectal ultrasound, is successful about 70 percent of the time, he pointed out. And it’s not much fun: “Transrectal ultrasound is an invasive procedure, and most men do not like it. There is a need for a new imaging technique,” he added. The method should be clinically available in five years or so, Dogra said. Breast cancer is another promising application for photoacoustics. As we covered in a December news story (“Replacing mammography with light and ultrasound,” BioScan), a photoacoustic mammoscope using IR light and ultrasound could create 3-D maps of the breast in an x-ray-free procedure that could help with early detection of breast cancer. The PA mammoscope was developed at the University of Twente in Enschede, Netherlands, and uses rapidly pulsed IR light to image blood vessels in breast tissue by the sound waves generated as the blood vessels expand in response to the pulses. Cancer tumors have more blood vessels than surrounding tissue, so they can be spotted. Biomedical Optics Express published a paper about the research last year (doi: 10.1364/boe.4.002555). Assistant professor Srirang Manohar, who led the research, and collaborators plan to improve the method’s resolution to compete with x-ray mammography and MRI; they also plan to add the option of using different wavelengths at once, which they expect to improve detectability, among other improvements. “We are now developing a clinical prototype system which improves on various aspects, including the patient-instrument interface, increase of detection channels and combining speed-of-sound acoustic attenuation imaging with photoacoustic imaging,” Manohar said. “The vertical resolution of the current system is limited by the curtailed Z-direction coverage due to the use of a single array with limited Z-direction scanning. Upon commercialization, the cost should be less than MRI or traditional mammography, according to graduate student Wenfeng Xia. “We feel that the cost could be brought down to be not much more expensive than an ultrasound machine when it goes to industry,” said Xia, the paper’s first author.